2 Restyling & tRuck AccessoRies | May 2015 restylingMag.coM Muscle Art. Identity Design of Jacksonville, Fla., wrapped this Chevy Camaro inside it's new 10,000-square-foot facility. Read how it took Identity Design just six years to expand 20-fold from it's original garage only at Restyling- Mag.com/features. Photo provided by Identity Design. 6.The high Profile of exTreme Audio Jake Rishavy Being a Discovery Channel personality wasn't enough for shop owner Mike Bartells. 12.Q&A: AuTo deAlershiP PoinT-of-View Staff A Florida dealership manager shares her experiences working with restyling expediters. 14.Are You uPgrAding Your Business? Josh Poulson The standards of professionalism restyling shops must adhere to for a shot at success. 18.Q&A: whAT's Trending in The suV & CuV AfTermArkeT? Staff Answers delivered by leading accessory providers. 24.reTAiler AlerT: CrediT CArds diTCh The sTriP for The ChiP Joe Dysart Restyling shops may be liable for lost funds due to credit card fraud this fall. 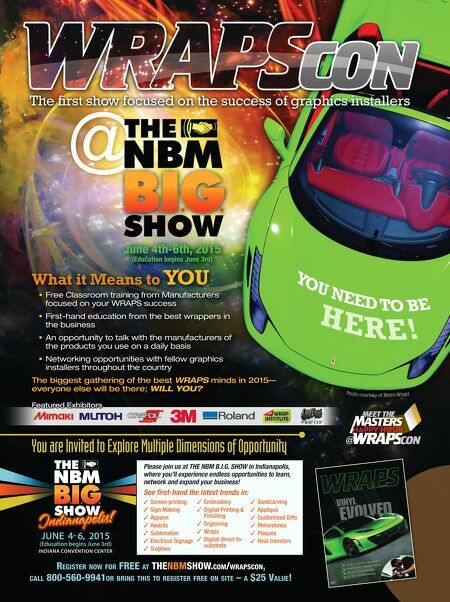 28.ProduCT showCAse: VinYl grAPhiCs & wrAPs Staff Featured tools and materials for vehicle wrapping and graphics services. 34.reinVenTion in moTion Keith Turner Flexibility and fearing no change is the business plan at ATD of Cleveland. 40.wrAP Your VehiCle & Yourself wiTh The righT sTuff Christine Corelli How to turn customer interest into in-store sales. 44.rx for heAlTh insurAnCe CosTs Phillip M. Perry Experts say Obamacare brings opportunities and complexities to the health care market. 56.finding & reTAining QuAlified emPloYees Jason R. Sakurai Shop principals stand to gain consistency and excellence. 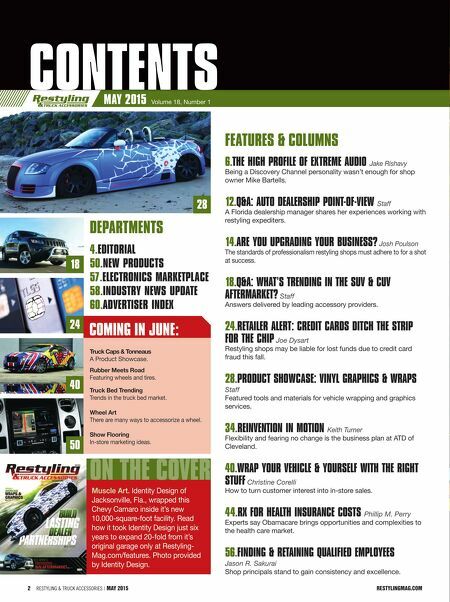 ConTenTs May 2015 Volume 18, Number 1 4.ediToriAl 50.new ProduCTs 57.eleCTroniCs mArkeTPlACe 58.indusTrY news uPdATe 60.AdVerTiser index 24 40 50 18 28 DepartMents features & coluMns on tHe coVer THE COVER coMing in June: Truck Caps & Tonneaus A Product Showcase. Rubber Meets Road Featuring wheels and tires. Truck Bed Trending Trends in the truck bed market. Wheel Art There are many ways to accessorize a wheel. Show Flooring In-store marketing ideas.